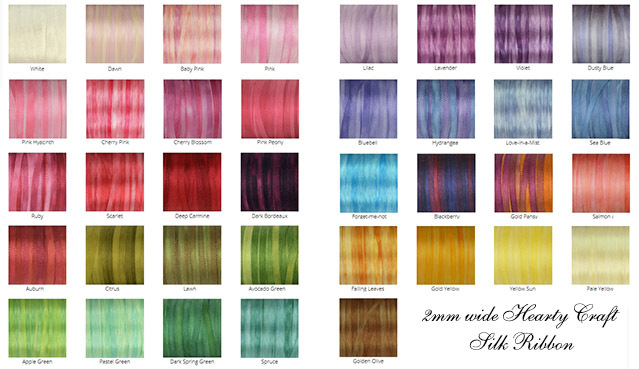 Four new shades have been added to our 2mm wide silk ribbon palette this week. They are Yellow Sun, Gold Pansy, Dark Bordeaux, and Sea Blue. Want to be the first to know about our new products? Sign up for our newsletter to keep up to date with our goings-on! This entry was posted in Site News on 29th May 2015 by Zinaida. We’ve got the ribbon in stock, but it’s not listed on the website. If you email me how many skeins you need, I could send an invoice for you via PayPal and post the ribbons on Friday. We’ve got 3 metre skeins only.